Getting prospects to join, getting members to participate, and getting participating members to serve as officers can be a lot of detail-oriented hard work. Our built-in CRM can significantly improve your efficiency with this. Contact Tracking - You can track individual contacts with a member or prospect. This could include phone calls, emails, messages, mailings, walk-ins, personal meetings, or any other contacts you make. 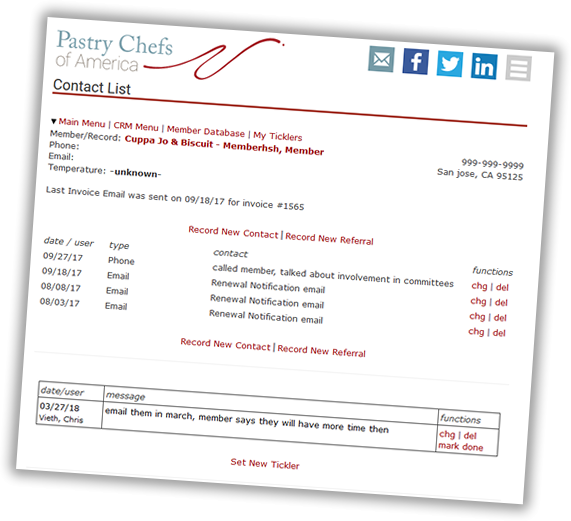 Auto Recording Contacts - Emails, renewal notifications, newsletters, drip-marketing messages, and more can be set up to automatically be recorded as a contact, so that you can have an at-a-glance look at the interaction you've made with a given prospect or member. Ticklers - This system also includes a tickler (aka reminder) feature. You can set an alert to remind yourself or another admin to contact a prospect or member in the future. This is very handy to follow up with prospects regarding membership or follow up with members regarding events and activities. If you want to recruite new members or engage your current members, this is a great tool to save time and manage your contact with members.